In the pristine environment of the Garden of Eden, our Creator gave to mankind His ideal diet. Green plants, fruits, nuts, and seeds appear to be what man thrived on in the beginning. God created us to consume these foods and to have a long life. This diet was for the long haul, as man lived over 900 years, even after the Fall. God designed man to live even longer; had it not been for sin, this diet would have worked well for even longer than 900 years. We refer to this diet as the Genesis 1:29 diet. It was the perfect diet for man in his perfect environment. Now, we know, too, that God allowed mankind to eat flesh foods after the worldwide flood in Noah’s time. We can only speculate as to the reasons for this, for God did not tell us why He then introduced meat into man’s permissive diet. As the apostle Paul says in 1 Corinthians 10:23, “I have the right to do anything,” you say—but not everything is beneficial. “I have the right to do anything”—but not everything is constructive.” (See also 1 Corinthians 6:12) Sure, it’s not against the law to eat a meat and sweet-based diet, but the results of doing so in our society show that this pattern of eating does not edify or build up one’s physical body. As a society we have made meat eating the rule rather than the exception. Instead of a whole-foods diet centered on plants we have adopted a meat-centered, refined-foods diet. The result of straying from God’s intentions for us is a health disaster never before seen in the history of the world. As people who profess to belong to God as bondservants, desiring only to live for God and His glory, we need to come to grips with what this means in the physical realm. Can we really eat like gluttons and truly glorify God in our bodies? We need to lay down our desires for food and let God direct us in what we should eat. Sanctification includes surrendering our appetites to God. Consider just a few pieces of the evidence with me. Researchers at the Harvard University School of Public Health have found that if people even kept to what the researchers considered to be a healthy lifestyle (which is below what we would consider healthy), there would be a 71% reduction of colon cancer in men, a 91% reduction in type 2 diabetes in women, and a 83% reduction in the rate of coronary heart disease.1 These are huge reductions in the major diseases which afflict our society, Christian and non-Christian alike. If a drug could get these kinds of results you know that everyone would know about it. Over 24,000 women in the VITAL study were followed for 8 years, assessing their risk of getting a diagnosis of breast cancer. When the all of recommendations of the World Cancer Research Fund / American Institute for Cancer Research were followed there was a 69% decrease in the risk of breast cancer.3 And these recommendations are attainable. They are maintaining normal body weight, participating in moderate physical activity for at least 30 minutes per day, avoiding energy-dense (junk) foods, eating 5 or more servings of non-starchy fruits and vegetables per day, limiting consumption of red meat to no more than 18 oz. per week, limiting alcohol consumption to one drink per day for women and two drinks per day for men, and limiting sodium consumption to 2400 mg per day. These days several high-protein diets are heavily promoted for weight loss and better health. But a recent study revealed that eating protein beyond the body’s needs can be detrimental for middle-aged adults, increasing by 4-fold (400%) the risk of dying of cancer during the 18 years of follow-up.4 The risk was attenuated or eliminated if the protein was plant protein, rather than animal-source protein. There are many more studies and many more results, some with conflicting evidence. Often the studies that seem to indicate that it is OK to indulge your taste buds get the most media attention, while the overwhelming majority of nutrition studies carry the same message—eat more fruits and vegetables and consume fewer animal products. Explore how to eat well and live healthy on a plant-based diet on The Hallelujah Diet website. Don’t be like Naaman, who initially refused the simple command of the prophet of God to receive healing. Could it be that easy? Could God really use fruits and vegetables to cure serious life-threatening diseases? The results with the Hallelujah Diet show that it really can be that simple. Try it! You, too, may find that God satisfies your mouth with good things, so that your strength is renewed like the eagles. 1. Rimm EB, Stampfer MJ. 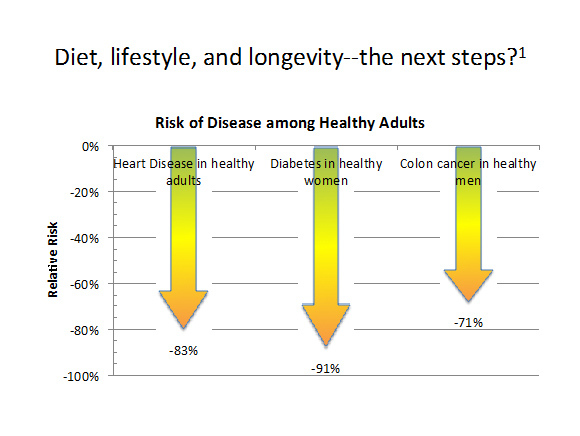 Diet, lifestyle, and longevity--the next steps? JAMA J Am Med Assoc. 2004;292(12):1490-2. doi:10.1001/jama.292.12.1490. 2. De Lorgeril M, Salen P, Martin JL, Monjaud I, Delaye J, Mamelle N. Mediterranean diet, traditional risk factors, and the rate of cardiovascular complications after myocardial infarction: final report of the Lyon Diet Heart Study. Circulation. 1999;99(6):779-85. Available at: http://www.ncbi.nlm.nih.gov/pubmed/9989963. Accessed February 25, 2009. 3. 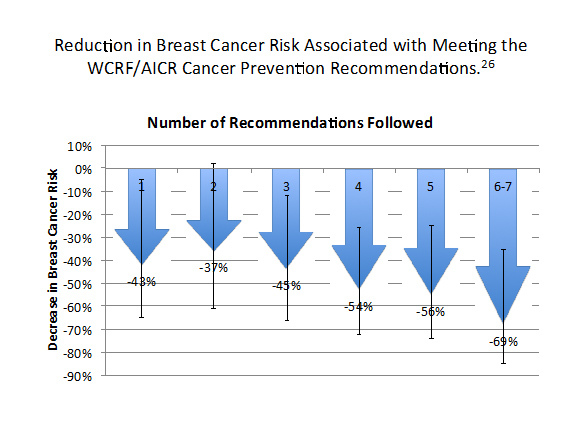 Hastert T, White E. Reduction in Breast Cancer Risk Associated with Meeting the WCRF/AICR Cancer Prevention Recommendations. Cancer Epidemiol Biomarkers Prev. 2012;21(3):562-562. doi:10.1158/1055-9965.EPI-12-0082. 4. Levine ME, Suarez JA, Brandhorst S, et al. Low Protein Intake Is Associated with a Major Reduction in IGF-1, Cancer, and Overall Mortality in the 65 and Younger but Not Older Population. Cell Metab. 2014;19(3):407-417. doi:10.1016/j.cmet.2014.02.006.